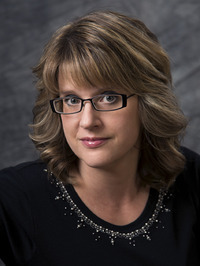 I had no idea Bridges Burned was the second book in the Going Down in Flames series by Chris Cannon. In the initial stages I felt quite lost, I had no idea about what had happened and I admit I nearly gave up but by the half way mark I couldn’t put the book down. Sixteen year-old Bryn McKenna is a crossbreed shape-shifting dragon, half red – fire breathing and half blue – water, she also has some other handy abilities that has the purebreds looking down their noses at her. Bryn was a great character, feisty, strong and witty, I loved her snark and the way she protected others, even those that didn’t deserve it. I enjoyed learning about the different castes and types of modern dragons, their uniqueness and abilities was written well and creative, being a dragon certainly had its advantages and I liked the way their shift was explained. We have a strange romance and I’m not sure how it came about in the first book but it didn’t make sense in this book to me, I found the relationship between Bryn and Zavien to be extremely frustrating, it was full of angst, misguided feelings and it seemed to be Bryn looking like the fool pining over him constantly, it was an aspect I didn’t enjoy at all. I did love the relationship she came to have with Valmont, her Knight and I am really hoping this will be explored further; forbidden love is always appealing for me. There are a few side characters that were wonderful. Clint and Ivy, Bryn’s best friends were great support to her and balanced Bryn’s character nicely. Jaxon grew on me as the book progressed, I felt terribly sorry for Rhiannon and grandma, despite her coldness initially was amazing by the end of the book. Chris Cannon has created a world that is intriguing and complex, the political aspect was entertaining and I am eager to see what will happen with the arranged marriage laws; the controlling Directorate and their archaic rules was an aspect I quite enjoyed and with Bryn not conforming to the status quo I’m curious to see if changes will be made to the system considering her grandfather is the head honcho. The plot was entertaining and fast-paced as we see different dragon clans for one reason or another attacking and causing havoc but with no clear motive for their behaviour. This book was a fun, easy read; the overall concept is a little generic and cliché but overall it was an entertaining light read. 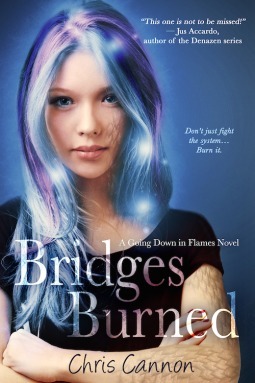 Thank you to Entangled Teen via Netgalleyfor the opportunity to read and review Bridges Burned. Oh wow. Yeah, you really need to read the first book to really get into this one and understand all the emotions that are taking place. The romance in this one was off-putting and I wanted to strangle Bryn for not moving on but I loved everything else in the story. Hopefully you're able to snag a copy of Going Down in Flames so that you can read how it all started.